We have never had such beautifully-colored eggs with nice strong shells or healthy-looking hens as we do now. All our chickens are beautiful and glossy with shiny feathers, bright eyes, and rosy combs and wattles. I believe it's due to the custom feed mix I have developed for them over the years. I call it the "Breakfast of Champion Layers". 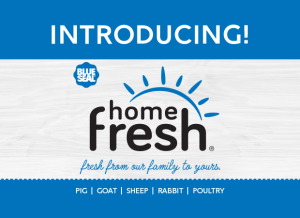 And I'm especially excited to have just launched a brand new line of all natural feed supplements under the Fresh Eggs Daily® label that are the same that I feed to my girls - so you can add them to your girls' diet! 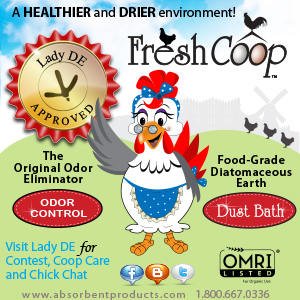 I have never had any problems with respiratory infections or other illness in my flock either, and I think it is due in large part to how strong our chickens' immune systems are because of what they are fed. Breakfast is the most important meal of the day, for chickens as well as for people, and my girls get this custom mix every morning before they get any treats. A hen eats approximately 1/2 Cup of feed per day (more in winter, less in summer, more if they don't free range). I mix up the feed mix a whole 40 or 50 lb. bag at a time and then just dole out the daily rations. 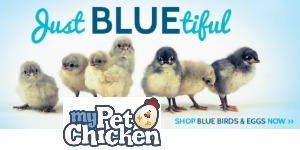 As your base, you can use any good-quality layer feed (or grower feed for pullets). Whether to feed organic feed or not is a personal decision. There are pros and cons to both organic and non-organic feed, cost being a main consideration. I recommend either Blue Seal Layer Feed (they sell both organic and non-organic) or a quality non-GMO organic whole and cracked grain feed. Check your feed bag label. Lots of feed companies have started adding supplements to their feed, such as probiotics, niacin (brewer's yeast) and even marigolds, so if yours already contains any of the supplements below, you can just omit them from the recipe, as long as the ratio is similar (most supplements are recommended to be added in a 1-2% ratio to feed). Oats can either be purchased in the breakfast cereal aisle of your grocery store or club such as Costco or Sam's Club or in bulk from your feed store or grainery. 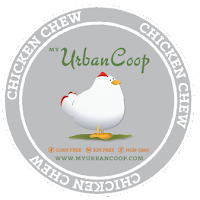 Added to the feed, they provide a bit of a treat each morning since the chickens love them, but also add a healthy dose of protein, fiber, antioxidants and immune system support. Studies have shown that chicks fed oats are not only healthier as adult chickens, but flocks fed oats are less aggressive, more heat-tolerant and less prone to cannibalism and pecking issues. Sunflower seeds provide excellent protein as well as magnesium and copper for strong bones. They also contain Vitamin B which is important for cardiovascular health, Vitamin E, which is an anti-inflammatory, as well as a healthy dose of antioxidants. 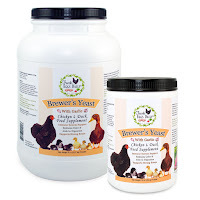 Brewer's Yeast and Garlic Powder is a great product, especially if you have ducks, because the niacin in the brewer's yeast helps them grow nice strong bones and legs. 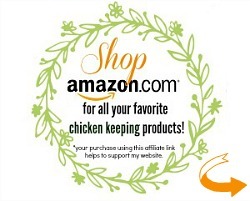 They require slightly more niacin than chickens do, but the added niacin won't harm the chickens any. The garlic helps repel fleas, ticks and other internal and external parasites, as well as having lots of health benefits and benefiting respiratory health. It also boosts to their immune system. The probiotic powder assures better intestinal health. Probiotics form a barrier that prevent bad bacteria from attaching to the intestinal walls and also aid digestion, assist in nutrient absorption and help boost productivity. 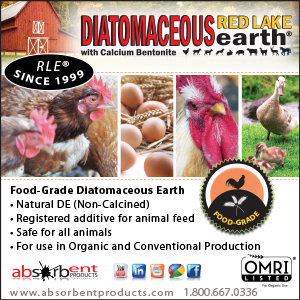 The Diatomaceous Earth is a natural parasitic and adds beneficial silica and other nutrients as well as keeps bugs out of the feed. Read more about the benefits of DE. Sea Kelp provides a wide range of naturally occurring vitamins (including A, B6 (niacin), D, E, folate and Vitamin K), minerals (including copper, lysine, manganese, phosphorus, selenium and zinc) and amino acids that improve bone strength, make nice orange egg yolks and result in eggs with stronger shells. Kelp also improves feather appearance and strength. 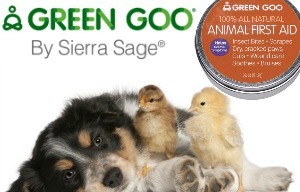 It is thought to protect against coccidiosis by strengthening the immune system and improving health in general. 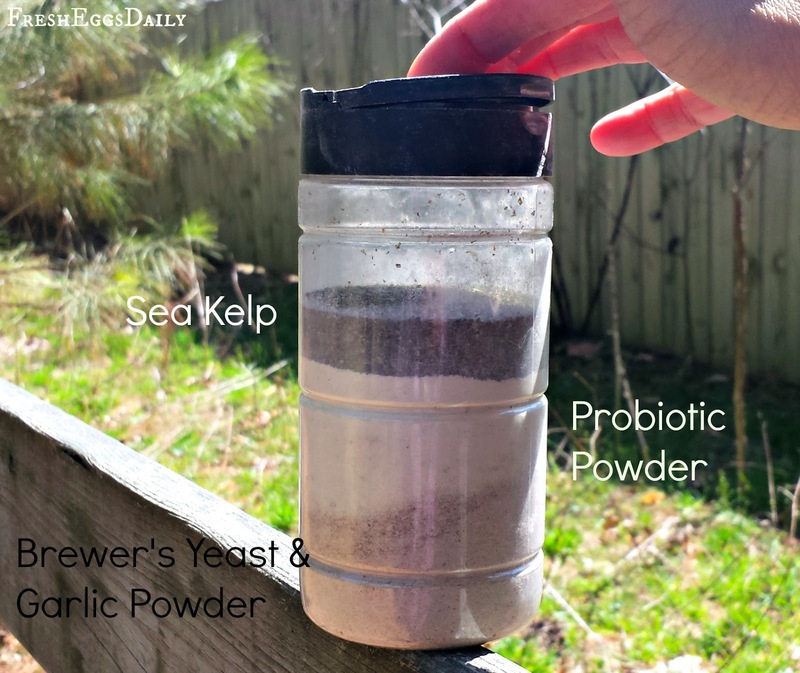 Kelp is also a prebiotic, which works hand in hand with probiotics, making them more effective and aiding in digestion. Culinary herbs are packed with nutrients and vitamins. I add herbs that I grow and then dry into their feed mix. I don't add any set amount or specific herbs, I just add what I have. Various herbs have great health benefits to laying hens. My oldest chicken (from our very first batch back in 2009) lived to be nine years old and passed peacefully in her sleep. 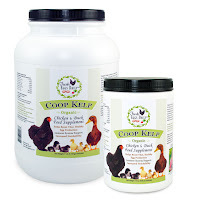 None of my chickens ever get sick - ever - so I am a believer in a few healthy supplements for better health and happier chickens! As you can see, sometimes they can't even wait for me to dish it out into the feeder ! There is literally no waste. They eat every crumb of their feed. Note: Good advice any time you change a pet's diet is to gradually switch over to the new from the old, mixing in small amounts a little bit at a time so as not to irritate their digestive systems. I start all my baby chicks on the supplements right from hatch so they get accustomed to them - and get a good start in life. 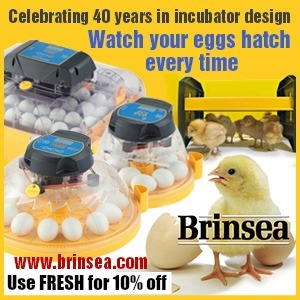 Copyright Protected Material: The information contained in this article first appeared on www.fresheggsdaily.com in July 2012 and subsequently in the book Fresh Eggs Daily: Raising Happy, Healthy Chickens...Naturally (St. Lynns Press, 2013). If you see the "recipe" from this article in print elsewhere, it was stolen from this site and used without permission. This is excellent...thanks for all the great information! Is this formula soy free? You have such healthy hens,and such in depth information. 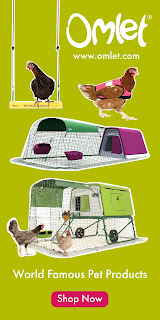 We are thinking about getting a few hens and I am definitely coming back to your blog for all your tips. 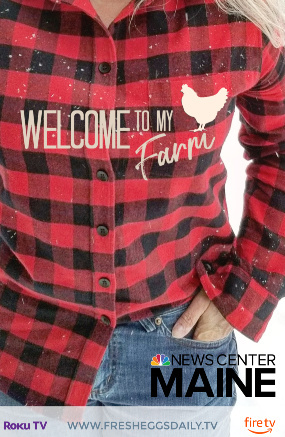 Have you posted pictures of the hen house, or where do they stay at night. Oh thank you! I try to keep it interesting but still get the information to you. 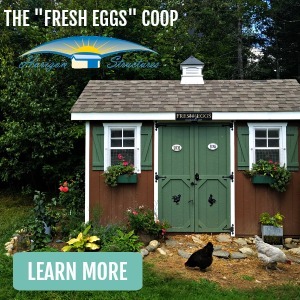 Here's a blog I wrote about my chicken coop - I am in the process of building a bigger one - I'll be posting pics once I get further along on it. IT DOES NOT APPEAR THAT THESE EXTRAS ARE ORGANIC? I don't believe that they are organic. If you raise an organic flock you would probably want to use my original feed 'recipe' - the link is in the body of this post - and add organic garlic powder, etc. They do and I believe they are distributed regionally because I've only ever seen the Country one. Try adding just a bit of the Ultra Egg to their feed and then slowly increase the amount as they get used to it. I am surprised they don't like it b/c its mostly flax seed which mine love. Mine would eat it out of the bag if I let them ! Can this be stored for awhile after you mix it? I only have 3 chickens, so it takes a couple months for them to go through a 50lb. bag. Since everything is dry, I guess it could be mixed in advance. Just be sure its stored in a cool, dry place. 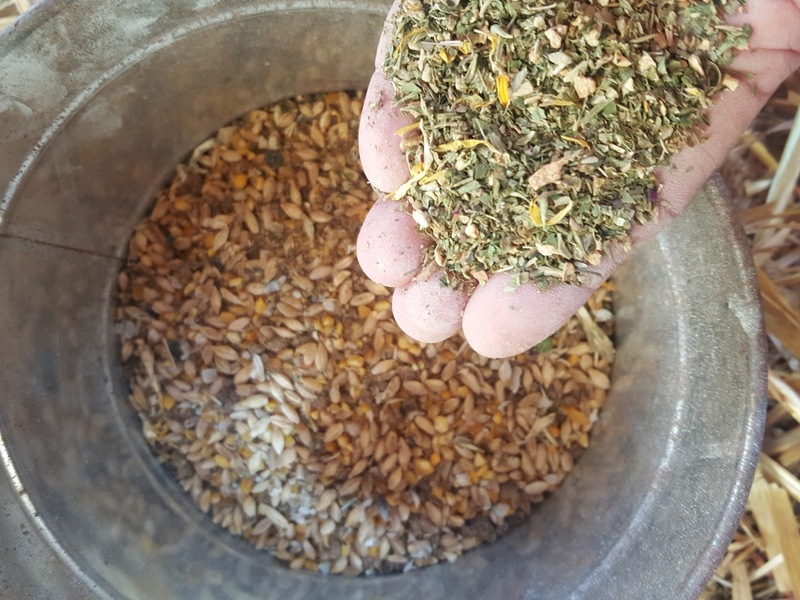 Feed is freezable, so you could mix up the whole large batch, then divide it into ziplock bags and stash them in the freezer, take one out to refill the chicken feeder as needed. I guess you could substitute grower feed for the layer feed while my chicks are still growing. What do you think? Hi. Yes for sure you could. I would just reduce the amounts of the supplements a bit considering they are smaller. My girls would be standing on the edge of the bucket and get poop in it! Could I use straight brewer's yeast? Already have some in the cabinet for my cookies I make for making milk for by baby! Question: The "1 Large Canister Old-Fashioned Oats," - would that be the type purchased at a grocery store in the breakfast section? Also - I'm an avid follower of your blog. Any chance you could post a recipe for chick food for growing future champion egg layers? I want to make sure my babies start out healthy, right from the very beginning! Yes, the old-fashioned Quaker Oats or whatever brand you want. Other than that, I skip the DE and Ultra Omega Egg until they get bigger and out into the run, but a bit of powdered milk and the Brewers Yeast and Garlic Powder, again just a little sprinkled over the top of their feed is helpful. Scrambled eggs are about the healthiest thing you can give baby chicks. I know alot of people think its odd or cannibalistic, but an egg yolk is technically a chick's very first meal and you really can't find a more complete food source. Great to know! I've been giving them a bit of organic Greek yogurt every few days and the garlic powder in their chick starter feed. I'll start adding some egg regularly as well as oatmeal, powdered milk and Brewers Yeast. We're expecting some more of our flock to hatch on the 30th and we're very excited! Excellent ! They will be healthy little ones! I definitely noticed a difference in this last batch I hatched. I've just recently really been getting into the holistic raising, natural supplements, etc and it makes a HUGE difference. Our chickens are all so shiny and SOFT. I can't get over it. Do you keep your girl's feeder filled all the time, or do you only feed them a certain amount each day? I have a large metal feeder hanging in their coop to keep it out of the weather and away from rodents. I kind of know how much they will eat throughout the day and try to just put out that much in the morning. Some days they run out and I refill their feed pans in the afternoon. Anything left over I give to the ducks. They get feed and water overnight. The chickens don't. Good Day..Fresh Eggs Daily...In this recipe you say to use Nutrena Layer feed, is that Nature Layer feed..or Country Layer feed, there both by Nutrena...I bought the Nature Wise Meatbird feed, by Nutrena, because it already has the probios in it, and the marigold for the yolks, and its 22% crumble, my chickens only will eat crumbles, and my black copper marans need the extra protein, and it says its for ducks and turkeys...what do you think about this feed....thank you. I'am also " Sharon Dodson "...on Facebook. I believe the two layer feeds are distributed in different areas of the country, so whichever you can find in your area. I have never seen the Meatbird but just by its title, if you are raising your chickens for the eggs, they shouldn't be on that. 22% protein is way too much for layers. 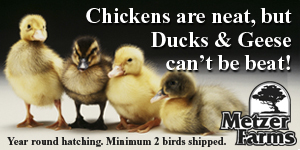 I am not sure why your Marans would need more protein than other breeds? But bottom line, any good quality layer crumble or pellet is fine to use as your base for this recipe. So do you give them this recipe just for breakfast? Not the rest of the day? 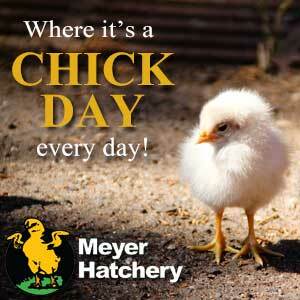 Chickens eat the majority of their daily intake in the morning. 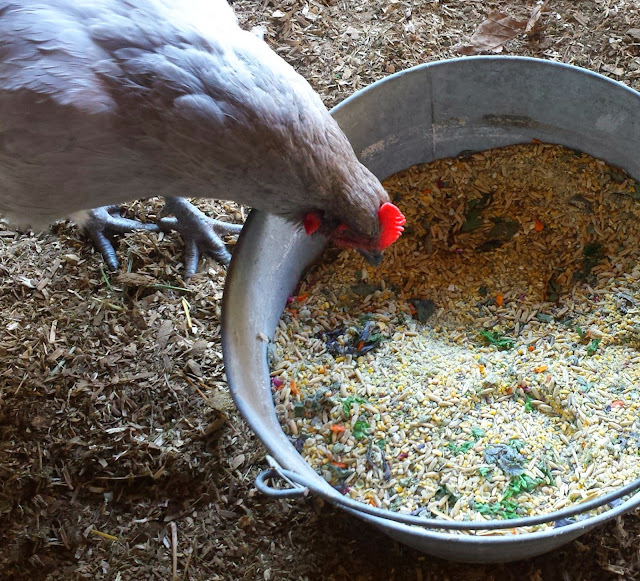 Since each hen eats roughly 1/2 Cup of feed per day, I measure out about that and put it out when I let them out. They pick at it the rest of the day. I generally bring them treats in the afternoon and will refill the feed if necessary then. Good afternoon Lisa....I was so glad to hear from you...I have been worried about the feed...the reason for the marans eating the high protein feed is they always act like there not getting what they need, and I have had alot of issues with them, they have had leg problems, and problems with the sour crop...and I was told that since they were a game bird they would need a game bird feed...and I also have 2 turkeys and 2 ducks, and I see your feed you make up, is for your ducks as well as the chickens, so would I be able to give that to my turkeys as well...I really like the stuff that you have in it...thank you so much...you have been such a blessing. Good day Lisa...I hope that your doing well, I had to tell you, I tried your recipe, two times now, and they love it, they ate everybit of it up, I have the lady at the feed store ordering me the Nature Wise Layer feed, by Nutrena it cost a little bit more but it already has the probios in it and the marigold extract, then I can just add the rest....I now have 5 little babies and there with there mother, I was wondering what can I give them since there all together, I have been having problems with the bcms I have two that cant walk, and one ameraucana that want grow, I have also been giving them the same feed along with extra vitamins, so I cant wait to see how it works for them....thanks Sharon. Hello Lisa, I was wondering if you can substitute Bene-Bac powder for the Probios® 180-D Dispersable Powder? I am not familiar with that - but if its a probiotic powder then I would say yes. Thanks for the recipe Lisa. I am going to get the things I lack and make a batch for my gals. Dear Lisa...All my chickens are loving the feed recipe...including the Marans...thank you. I used stuff I had on hand to go ahead and mix this up now. I am ordering the Omega Ultra Egg stuff from amazon. In the meantime, I had most of the other stuff on hand and went out and mixed it into their food. 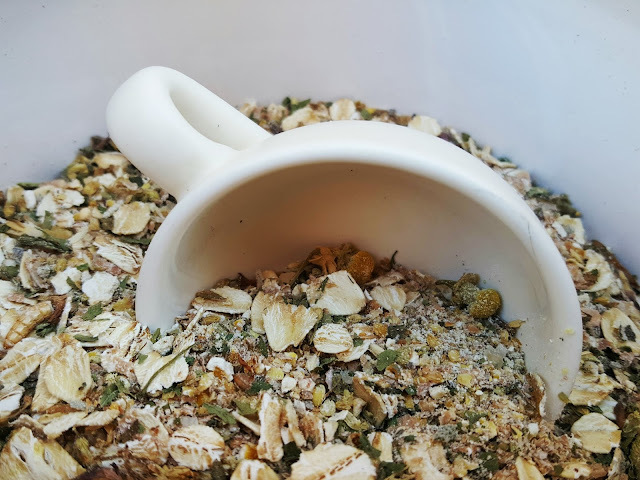 I always give my hens a little bit of hemp seed (it's very healthy), so I added my hemp seed and a little bit of wheat berries as well. They didn't seem to dislike it and ate it up - which is a good sign! Thanks for updating the recipe to 50 lb size, that's great for my system! Also, where did you get the pails with lids? I could definitely use them all over my garden! 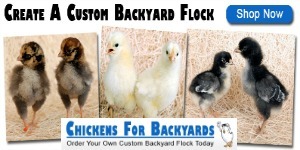 Your blog was a great resource for me regarding my backyard flock, and I find they are happier because of the additions I have made based on your recommendations. I found the pails at True Value I think - but Lowes or Home Depost should carry something similar. And thank you! I just placed my amazon order for 5(ish) pounds each of the probiotics, omega egg, and yeast/garlic add ins. How many batches of 50 pound crumbles would you estimate the packages make? I've been feeding your original mix to my flock for a while now and have loved the difference I've seen in both eggs and the health of my girls over all. I'm excited to finally try out the new mix it seems SO much easier to make. Oh, I'm also planning to make up a batch of custom scratch now that cooler weather is coming around. I have some extra flax seed from my last batch of feed that I didn't use, can I add it to the scratch or is there such a thing as too much flax since they'll be getting the omega egg in their feed still? Hmmm..that's a good question, I have never kept track. I really should do that I guess. Next time I open a new bag, I'll mark on it how many 'batches' it makes. You can still add the flax seed, I would probably skip it going forward since you'll be using the Ultra Egg which has flax. I've only found small bags (1 lb) of shelled sunflower seeds, where can I find bigger ones? This is a great recipe. Thanks for this info! Is this safe for geese also? Hi there. If you start feeding feed that has some of the supplements in it already, then just skip those and add the ones it doesn't have. 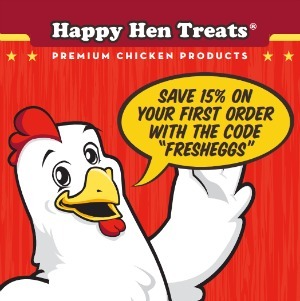 Don't forget also that Chickens for Backyards gives our fans 10% off any purchase using the coupon code FRESH. That will help on the cost. The original recipe calls for 1 part of sunflower seeds to 10 parts feed. For a 50 pound bag, wouldn't that be 5 pounds? That's about 4x what this recipe calls for. Why the reduction? The sunflower seed and cracked corn are pretty much 'treat' additions. With the addition of the other few supplements, I cut down the amount of both the corn and sunflower seed mostly for a cost-savings. Those two additions are sort of arbitrary and feel free to add as little or as much as you want - although too much corn isnt' good for them. It really isn't that easy to make a complete balanced layer feed. I wouldn't recommend it. 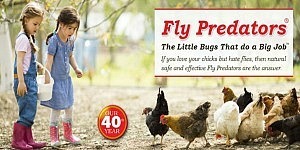 Instead try and find an organic feed from www.scratchandpeck.com or www.organicfeed.com. How many pounds of cracked corn equal 2 cups? How many pounds of shelled sunflower seeds equal 4 cups? I have no idea, I kind of just scoop everything out. I buy the bags of sunflower seeds the feed store sells - 5lb? maybe? and that's maybe 16 cups or more.. The cracked corn I buy in bulk also and just scoop out. Thank you for replying so fast. I noticed that one recipe calls for 2 cups of cracked corn and one calls for 4 cups. Is this dependent on whether it is summer or winter? Also, at what age can I introduce the cracked corn, oatmeal and shelled sunflower seeds. I do give them grit. My chicks are 4 weeks old now. I did reduce the amount of corn. The corn and sunflower seeds are just really treat additions and I have started adding less corn. Also, yes I do feed less corn or scratch in the summer since they get more weeds and grass, etc. I generally don't start my chicks on this until they are outside, maybe 8 weeks old. I do add probiotics and the brewers yeast & garlic powder right from the start for them. Oatmeal too, right from the start as long as they are getting grit. You are welcome!Sounds like you are on the right track. The healthier start you give them fewer potential problems down the road. I'm expecting my chicks to arrive in the mail tomorrow. I'm starting them on medicated chick starter. When would you suggest I start them on your breakfast of champions? I sprinkle a bit of probiotic powder on my chick feed to help with digestive health. The rest, I would wait until they are about 10 -12 weeks old and outside. Is this ok to feed to 8 week old chicks? I am still feeding them flock raiser feed (actually we're just switching with this next bag, and I wanted to add these extras for their health, but wasn't sure if it is ok to give them sunflower seeds or cracker corn yet. They will also be going outside to their coop this weekend (hopefully), so I wanted to give them something to keep them warm. Thanks! Oh, also, is this the type of sunflower seeds you buy to fill birdfeeders? We have a ton of those for our birdfeeders, and didn't know if that would be ok for the chicks too. Sure you can. We don't recommend flock raiser tho, its more for meat birds. 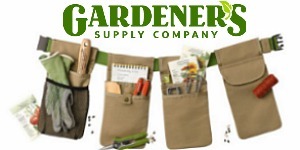 If you have layers, get them on a starter/grower. But yes they can have the cracked corn and seeds. They would love some warm oatmeal as a treat to help keep them warm too. And yes, regular bird seed sunflower seeds are fine. Shelled or unshelled is okay, just be sure they are UNsalted. No you're fine, it won't kill them, I just feel it makes them grow too fast which you don't want for layers. Don't worry about it tho, and you're right about the calcium. Also, rolled oats ok? Or just the oatmeal type of oats? Sure any kind of raw oats. I use the Quaker old-fashioned, but any kind is fine. Hi, and thanks for the great recipe! We are new to raising chickens, and have five 10-week olds. We've been doing a lot of research, and are currently feeding fermented food every day along with all the free ranging they can get! I can't think of any reason I couldn't ferment your recipe, can you? I haven't looked into fermenting feed much - I've read a few articles but never really done my research on it due to a lack of time. Hi Lisa, I'm getting back into raising chickens after quite a long hiatus. Love you site and blog and am learing a lot of new stuff that I never realized.What i'm wondering..back when I raised them it was common practice to start them out on "turkey start" as it had more meds in it. Is that still a good idea or should I stick to the chiken start ? I would stick to the chick starter. I don't used medicated starter anyway. If you raise healthy chicks and give them apple cider vinegar, probiotic powder and garlic, I think they build strong immune systems and don't need medicaitons. I love the mix you have put together. I'm definitely going to try it. Our 15 girls went through a dry spell and I don't know if it was due to the cold weather but, they just stopped laying. Then we would get a few eggs here and there. We were truly puzzled then we read where you said, something about molting. That made since, too. Here recently we were getting a dozen a day, then they stopped again. We can't figure out what is going on? Do you have any suggestions about maybe what they are doing? Looking forward to your feedback. Thanks so much! Most likely the shorter days...but days are slowly getting longer, so they should start up again. Another thought may be that there is a predator lurking. 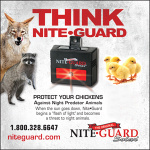 Even if they are locked up safe at night, just the presence of a predator can stress them and stop laying. What about chia for omega levels? I use a lot of chia so I have it on hand. It has more omega than flax, and is considered a complete protein even though it has a little less protein an flax does. Sure, this recipe isn't set in stone. So go ahead and sub in the chia seeds. What about the Purina Omega 3 feed instead of the omega egg? I also heard/read that the shells of black oil sunflower seeds have something in them to help birds not want to eat the others feathers and thus could help reduce feather picking so wouldn't you want in shell sunflower seeds? Thanks! I'm not a huge fan of Purina Feeds but sure, if you feed the Purina Omega 3 then just skip the Omega Ultra Egg. Also, if your feed has probiotics in it as some do, you can skip that. Added protein in any form can help with feather eating, so either shelled or unshelled sunflower seeds are fine. If your girls will eat them unshelled, then by all means use them. What would the ratio be for just adding garlic powder instead of the Thomas Labs product? Also, could I use ground flax seed (meal) instead of Omega-Egg? Thank you for the information on your blog! It's an incredible resource. I guess I would just add half if you're only using the garlic powder. I don't know the ratio in the Thomas Labs product. And yes you can use regular flax seed but if you use ground it loses its nutrients quickly so I would add it each morning. You can use whole flx seed tho and mix it up in the large batches. Thank you! Also, I was wondering what layer feed you use. I was a little torn between Purina and DuMor. I'm feeding DuMor Starter-Grower currently. I use Nutrena. Rumor is a Purina brand. So am I going to get "bad eggs" if I just give my poults a good layer food and then just try to give them all kinds of other nutritious scraps? I give them yogurt and mealworms and veggies all the time when I have scraps. Do I need to do more? They look super healthy. But this is my first year going for egg layers. Not at all. They will lay you perfectly good eggs on a good quality layer feed. But just like people, the healthier the diet, the healthier they will be. 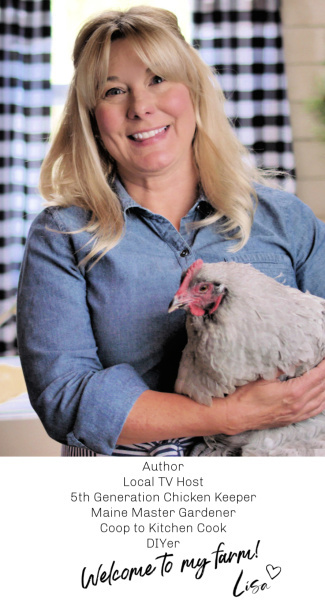 Lots can go wrong with chickens, they get sick and hide their symptoms, it's often hard to tell when something is wrong so I believe in keeping them super healthy so they can fight things off themselves. What is the cost per chicken per year? I've never priced it out on an annual basis. It all depends on how much you can find each of the supplements for, how much the feed to feed costs....it's really hard to say. With this feed do you still supply oyster shell? Yes steam them. Search steaming eggs in the search bar. They will peel every time perfectly. Yes I do - well I put out crushed egg shell for them instead. Free and easy. Doesn't that encourage them to become egg eaters? Nope, I've been doing it for years and never had any egg eating issues. I need your input, Lisa. I made this feed recipe using everything you have listed and my hens barely pick at it. I only have 2 hens and they swear they didn't get the memo on what backyard chickens eat. I can put kitchen scraps out and they turn their beaks up at it. I really wanted them to have the best feed along with the bugs they find, but what is wrong? What they do devour is scrambled egg, shredded apple, shredded cheese, meat, meal worms. I don't give these until I have seen them circle the feeder and leave. Grrr. Also, one of my hens "crows" every morning at dawn. What's up with THAT? Thank you, Lisa! No it does not. I've been doing it for years and never had a problem. Egg shell provides protein. Oyster shell provides calcium. They need both, but do not mix oyster shell,in with their feed. Offer it separately and they'll take what they need.